Hello friends, I’ve been quiet lately, but I finally have more new work I can show you! I recently listened to The Subtle Knife by Philip Pullman on audiobook (making it the 5th time I’ve read the book). Its such a fantastic series, and my understanding of it deepens as I age and become more aware of the world around me. As a tribute to one of my favourite book series, I wanted to illustrate a cover for the Subtle Knife (mainly for me, but also to send out as self promotion). Here is the drawing. 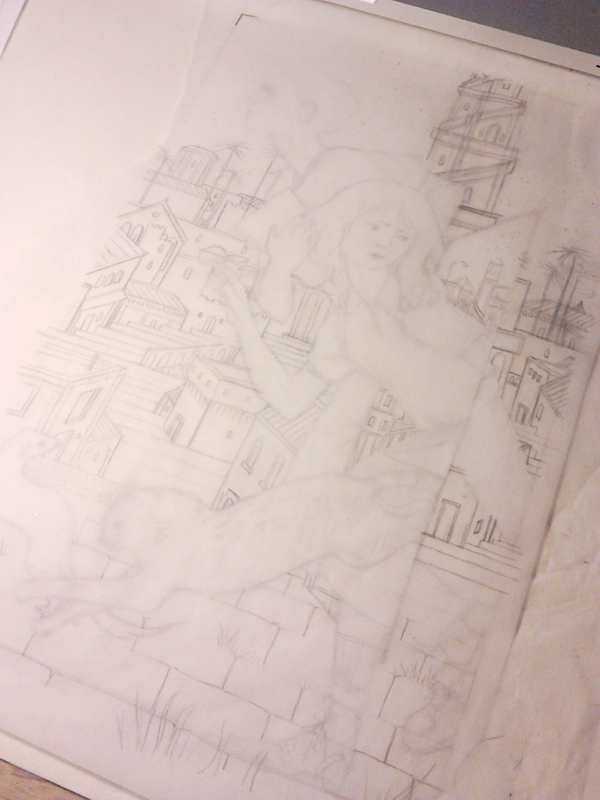 I tend to draw my city backgrounds on tracing paper so I won’t interfere with the figures if I need to erase a lot or start over. Lots of trial and error in this stage! Once the drawings are done, they are scanned, blown up and transferred to the watercolour paper. 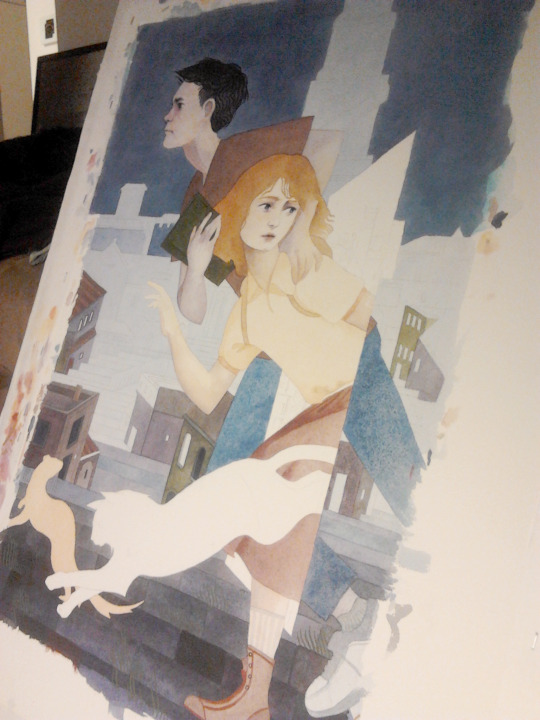 For this painting I decided to use some of my 300 lb Arches rough watercolour paper, so I made the piece pretty large. The roughness of the paper is great for granulation and texture, but it makes small details hard to see when scanned, so I had to work big. The finished size is around 16″x 25″. The winning colour rough. I found out that (in my personal work) I prefer to paint night scenes, if only because I get to paint little lit-up windows and stars. 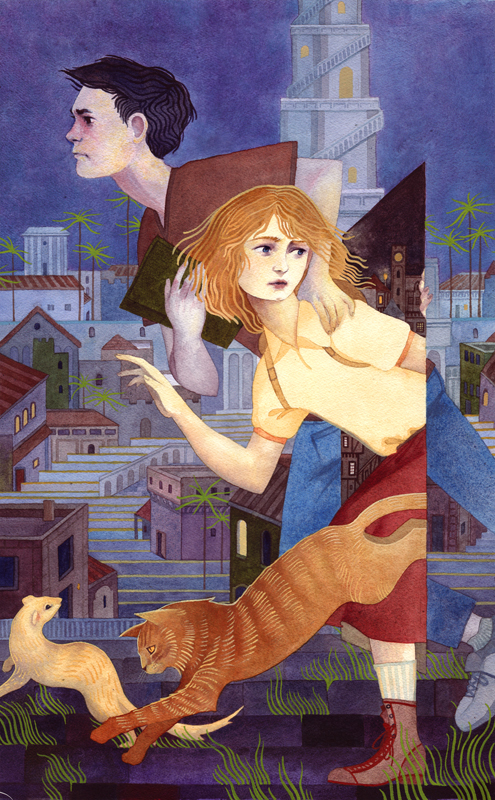 You’ll also notice that many of my illustrations have a similar colour palette, this is because I cant resist using my favourite paints: alizarin crimson, venetian red, quin gold, prussian blue, and cerulean. I always depart from that simple formula a bit, but you can make almost any colour with those. 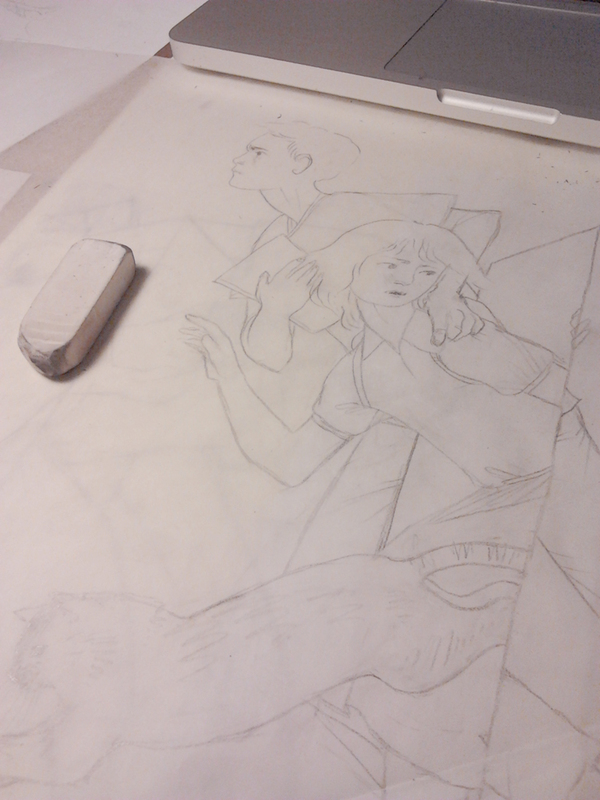 Once transferred to watercolour paper (I HATE transferring, so I’m not talking about it here), the fun really starts. 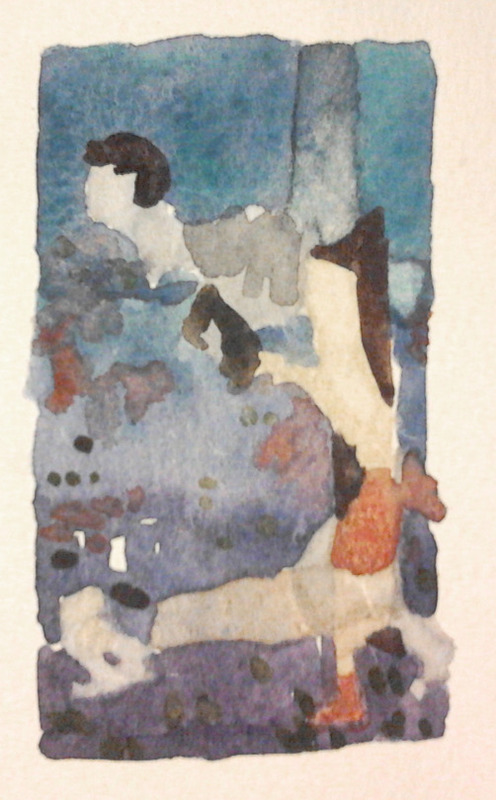 For this piece I started by staining most of the paper with ultramarine blue ink, giving me a good colour base for the rest of the piece. I work in patches usually, trying to get the first washes down to start defining values. I end up revisiting a lot of areas to make them darker or change their hue as the painting progresses. I’ve also just started using opaque gouache in my work, which allows me to worry less about maintaining my highlights (in watercolour you have to avoid painting areas you want to stay white/light). I’m very happy with how it has turned out so far, and I cant wait to get ahold of it in Photoshop, clean it up a bit and push my values a bit more. I don’t know when you’ll see the final, hopefully in a week and a half, but things are awfully busy this month! I’ll keep you updated! Enter your email address to follow Serena's Illustration Blog and receive notifications of new posts by email.